This ... THIS ... has been the secret project. The one I couldn't explain much about, because if I said anything of substance, I would give away a secret that wasn't mine to tell. 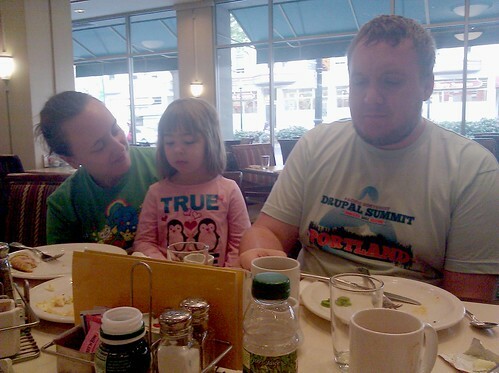 Here's the problem, and the joy, of the Drupal community. Everybody knows everybody. Doesn't matter that we all live in different states, or that we work for different companies. We know each other. Sometimes we know MORE about each other than we want to know, and the only way to keep a secret is to keep your big, yapping trap shut. More than anything, I wanted it to be the equivalent of a smile. 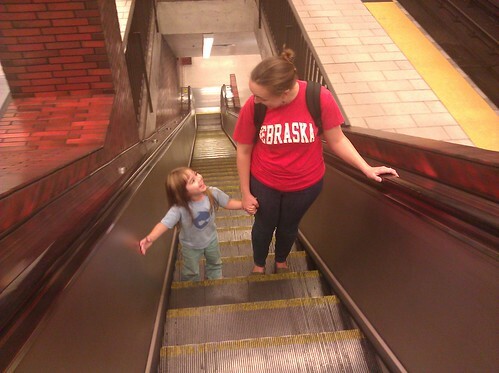 Not a nasty in-joke, but a sweet one, because I defy you to look at these photos and tell me "She's not ready to be a mom, nope." at Central Oakland, Oakland, California, United States by domesticat. DrupalCon Chicago pajama fabric for cutting. I wanted it to be simple, so I thought ... why not squares within squares? 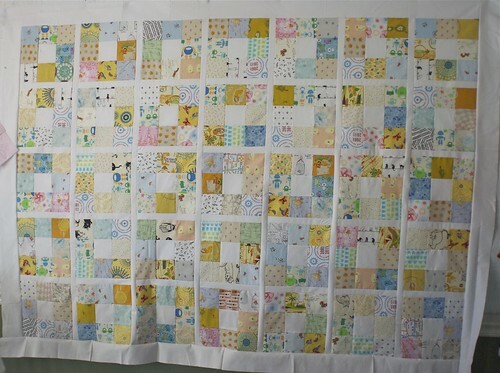 That would give me room to do something a little interesting with the quilting. Make it personal -- though I didn't know how, just yet. 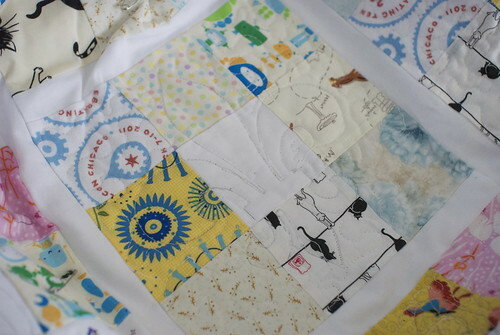 I made it personal for me, too; this quilt is yet another in the set that contain pieces of Jeff's hospital gowns. 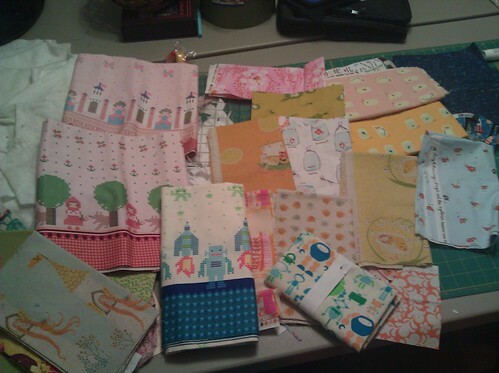 This is an incredibly deliberate choice for me -- and no, I won't tell you which fabrics they are, unless you ask. I don't see it as "sharing the pain," but instead more of a gesture, of trying to find a way to say, "Thank you for the solidarity." 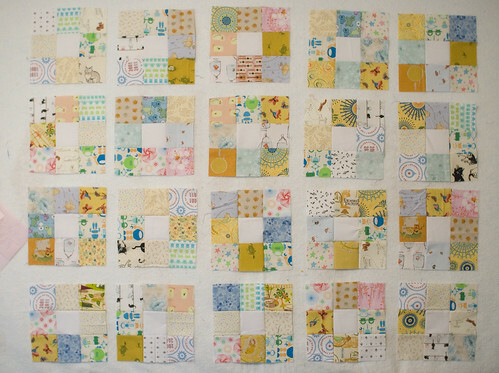 Every time I cut pieces of those hospital gowns and put them in a quilt, it is a tangible expression of thanks. 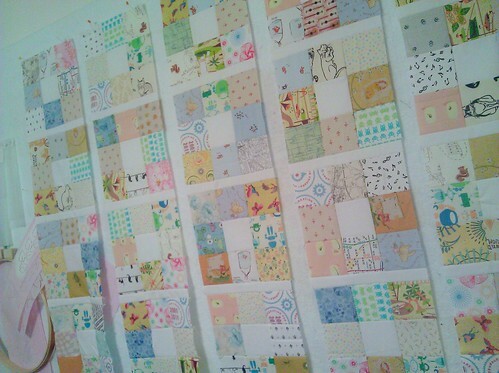 I didn't really have a name for the quilt, just a stronger impression of color and emotion than a name. 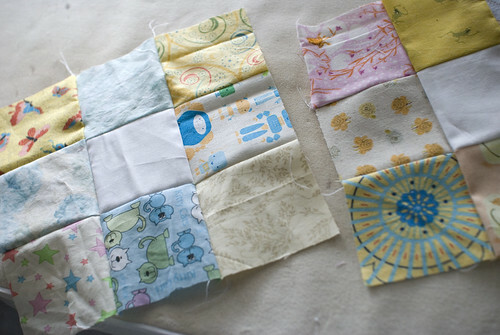 As I sewed the squares together into sets-of-nine, I found myself thinking of the white square being like a little matryoshka doll, hidden inside others. I liked the euphemism for pregnancy -- a little surprise, hidden inside. I called it named and moved on. Dave and Jenny are in the middle of that diagram, and they are the ONLY people in the middle of that diagram. The secret would've been out in a heartbeat. So, Ms. Yappy Pants had to keep her trap shut. 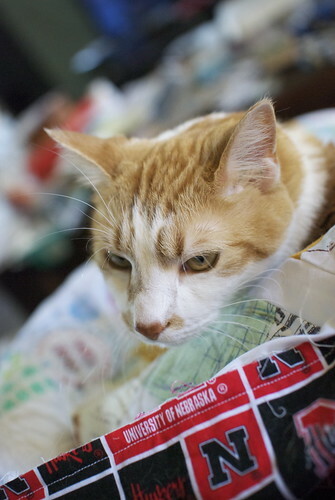 There would be no showing of Tenzing helping me bind the quilt, because oh look! Nebraska! Iz comfy. I stays here. 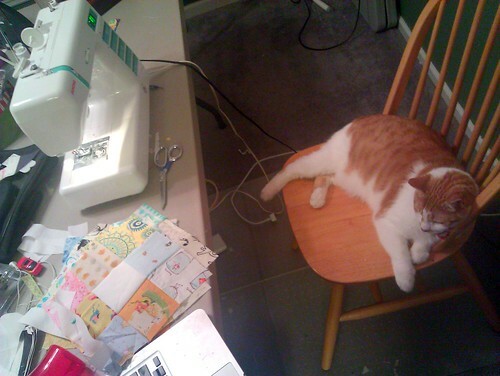 So Tenzing and I got to work. 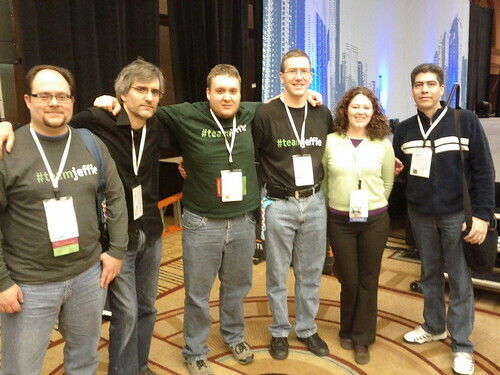 After all, there was the unspoken deadline of DrupalCon Denver. Like I would miss out on the opportunity to give them this quilt in person. Luckily, Tenzing was up to the task. at Alabama, United States by domesticat. and turned them into strips. 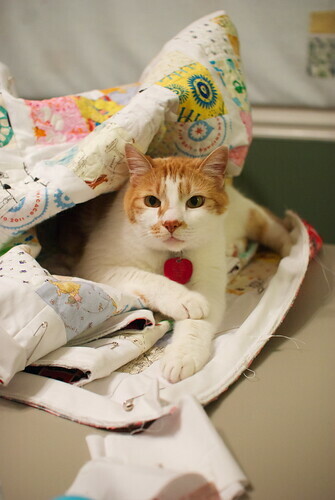 and as expected, had to fight The Usual Suspect for access to the quilt. I was sitting in the Huntsville airport, still frantically weaving in thread ends, when my flight to DrupalCon Denver was cancelled. I was sent home with a ticket for the first flight out the next morning, and I spent most of the evening finishing up the quilt. It's the only time that having a flight cancelled was probably a good thing -- I don't know that I would've finished the quilt, otherwise. It got done, though, and just in time. Jenny got to see it right before she had to fly home, and Dave got to have it in-hand for almost all of the convention, and I got to grin like a fool every time we showed it to someone. It was silly and whimsical and my usual twin-size, so it'll still be useful for the little one even after The First Birthday. "Guess you'll just have to come visit, and photograph it again." 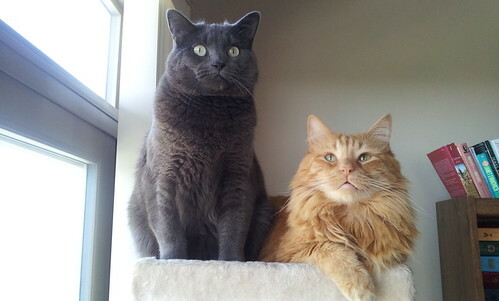 It means I'd finally get to meet Athena and Rodney in person! 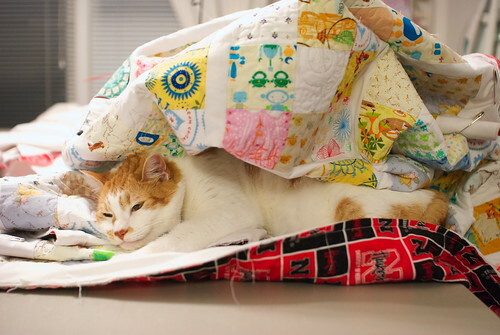 There are worse things in life, I must say, than sending a quilt from one orange tabby to another. LOVE this. How adorable! 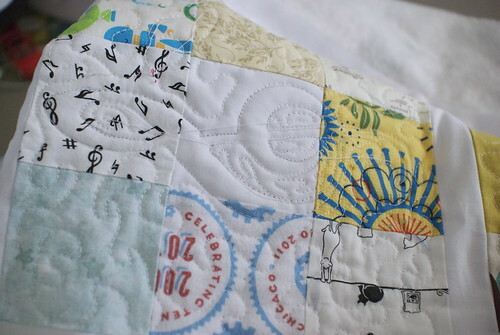 And it took me until the 2nd time to see the actual treble clef *stitching* on the quilt. Too awesome.